Welcome to the Minnesota Maple Syrup Producers' Association Member Directory. You can use the Search box to look for Member Name (first or last), County or Zip Code. If you click on the Member Name, more information will display for that member. New website design, including new registration and member signup/login options, also a feed from our MMSPA Facebook page. See the EVENTS page for details on upcoming events. See the NEWS page for recently added articles impacting the maple syrup industry. Watch our SUPERIOR SWEETNESS CONVENTION page as we add details about the 2019 NAMSC convention in Duluth, MN. 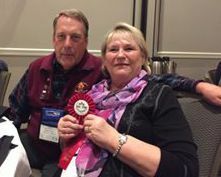 Stu and Corinne Peterson win 2nd place for their Amber Rich Syrup at the 2018 NAMSC / IMSI Conference in NH.